I had the Frederick Cellars 2002 Cabernet Sauvignon this evening with some minestrone soup and homemade bread. I was absolutley surprised by the wine. Not pleasantly either. Now I may not have Robert Parker’s palate (it has been reported that he can remember every wine he ever tasted!) but it was only five days ago that I tasted this at the winery and it was a completely different wine tonight. First of all it was a lot redder- had none of the brick red color I saw at the winery. It has an overwhelming nose of acetone/nail polish remover. There were flavors of red fruit and cherry with some oak, but it was very thin and sour on the finish. I know there can be bottle variation, but it makes me wonder what was poured at the winery to be honest. I dined with Mrs. Fred and the parents of Fred, and we all agreed generally on the wine. 81 points. Heritage Red 2004: ($16). This is a blend of Cabernet Franc and Merlot. Was medium bodied, with flavors of sour cherry, and some peppery notes. Has some mild tannins on the finish. Not especially complex, but would be an excellent wine with food, especially Italian. 86 points. Merlot 2005: ($18). Nice bright red color, flavors of cherry and some cassis. However it was one dimensional and rather thin. This was my least favorite of the reds. 81 points. Cabernet Sauvignon 2002: ($24). At five years old this was a nice brick red color. Full bodied with flavors of black cherry, with hints of smoke and leather. Had nice tannins and a long finish. This is a bottle to drink now. I think it’s at its peak. At $24 it’s not a screaming value, but we bought a bottle and will enjoy it over the holiday season. 89 points. Chardonnay 2005: ($16). Not much nose, but lots of flavors of pear. Nice and dry and finished up with a strong minerally finish. Very little oak and none of the butter that I despise. Much more like a Chablis than a California Chardonnay. Very good if you like more austere whites (which I do). 88 points. Riesling NV: ($16). This wine was made from grapes from New York State and is a non vintage designation. It had a huge floral nose. Tons of pineapple and lemon on the palate. A hint of sweetness on the finish, and nice crisp acidity as well without being too acidic. Bought a bottle to go with our soup course on Thanksgiving. (Apple and Celery Root soup with bacon-chive oil) 86 points. In sum the wines were generally good. This is a local winery worth supporting and you will not be embarrassed serving any of these wines to your friends or giving them as gifts with a local flavor. You can buy them at several wine stores in the County check their website) besides getting them at the winery itself. Seek them out. 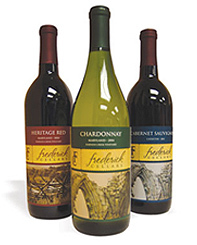 After all when was the last time you had a wine made in Frederick? Mrs. Fred and I paid a visit to Frederick Cellars today. Frederick Cellars is one of six wineries in Frederick County and is located in downtown Frederick on East Street just north of Shab Row. 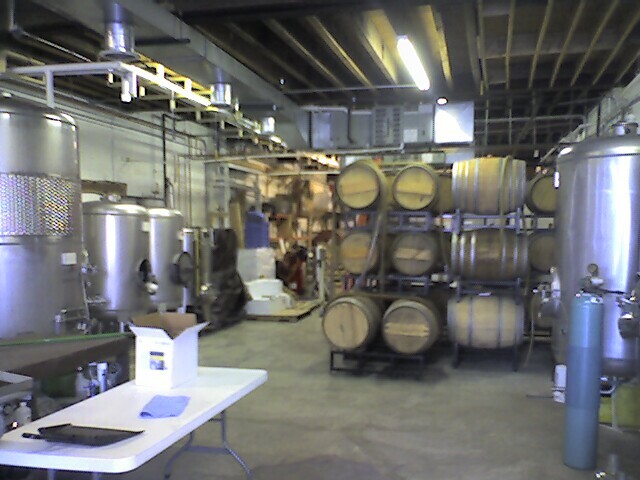 It has the distinction of being one of the few urban wineries in the country. It sits in a beautifully remodeled old ice house that was built around the turn of the last century. The first thing that hits you when you walk in is the smell. They make, store and bottle all their wines right here in the building and there is a beautiful aroma of grapes that permeates the air. There is a large bar for tasting, and around the room there are displays of their wines as well as chocolates, wine related books and other goodies for sale. On the walls were pictures exhibited by a local artist, which our host indicated changes monthly. We were greeted warmly and since we were the only patrons in the building at the time we had our hosts undivided attention. At the bar they offer nine of their wines. You can pick any five for a tasting flight for $6 or they offer each one by the full glass or bottle. They have a nice explanation sheet of their wines and pencils at the bar to write down you preferences, and tasting notes if you’d like. We went with the tasting flight and after some deliberation we each picked out or five wines to taste. As it turns out it didn’t matter which five we picked as our very enthusiastic host ended up giving both of us a pour of all nine of their wines! Anyone who buys a tasting flight gets a tour of the winery which is in the room next to the tasting room. They grow their grapes from two vineyards: one in western Frederick County, and one by Annapolis. They also buy some other varietals to round out their production. 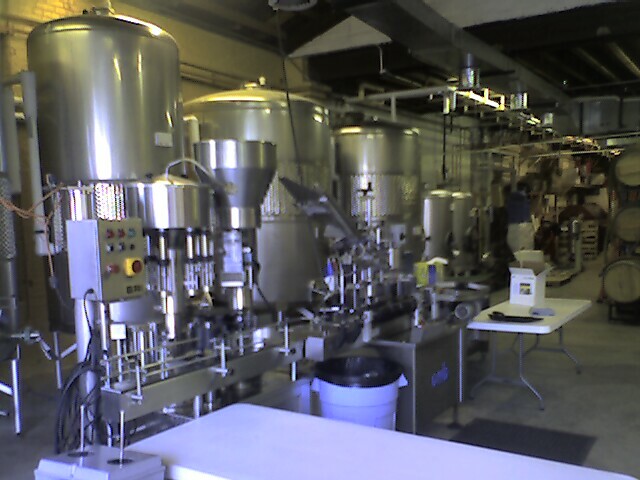 In the production half of the building there are the crushers, fermentation vats, oak barrels, filters, and bottling apparatus. Our host walked us through and explained their process from grapes to bottled wine. It was fun to see where they were made right after tasting them. We both thoroughly enjoyed the visit and agreed it was a great way to spend and hour and a half on an afternoon. We enjoyed being the only ones there. Our host says it gets quite busy on weekends so I would consider going there on a weekday. Overall I would highly recommend it for anyone with even a passing interest in wine.